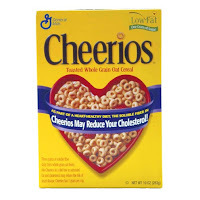 Cheerios can help you tackle your cholesterol by making heart-healthy oats part of your diet. Sign up to receive $4 in Cheerios coupons, and enter for a chance to win a free box of Cheerios. Over 50,000 full-size boxes will be given away! Details: Over the coming weeks you will receive 4 emails each with a $1 coupon. If you win a free box of Cheerios® cereal, you will be notified by mail in the next 6-8 weeks. Great tip! I do love my cheerios! p.s. Will Cheerios give me a tiny belly? LOL.